This Persistence Market Research (PMR) report examines the regenerative therapies market for the period 2016 - 2022. The primary objective of the report is to offer insights into developments in the regenerative therapies market that are significantly helping transform the growth trajectory of global businesses and enterprises associated with the same. Regenerative therapies entail the application of specific types of cells or cell products for diseased tissues or organs, which ultimately help restore usual tissue and organ function. It also includes the possibility of growing tissues and organs in the laboratory and safely implanting them when the body cannot heal itself. The regenerative therapies market holds major potential in the near future, which is attributed to the increasing application of these therapies in the treatment of various classes of diseases. The prime factor responsible for the same is the collaborative R&D efforts undertaken by researchers and manufacturers to develop and introduce newer and more efficient therapies. Orthopedic, cardiovascular, and soft tissue repair are the three main application segments in the global regenerative therapies market. Recently, there has been an alarming rise in the incidence rate of these disorders across the globe. Soft tissue repair and skin restoration therapies are currently the most widely adopted regenerative therapies globally. Surge in government support and funding from various organizations for R&D related to regenerative therapies over the last few years and increasing incidences of chronic diseases are among the major factors driving growth of the global regenerative therapies market currently. This report covers the global regenerative therapies market performance in terms of revenue contribution from various segments. This section also includes PMR’s analysis of the key trends, drivers, restraints and opportunities, which are influencing growth of the global regenerative therapies market currently. Impact analysis of the key growth drivers and restraints is also included in this report to better equip clients with crystal clear decision-making insights. The regenerative therapies market report begins with an overview of the regenerative therapies procedures, covering the reasons why the patients are increasingly adopting these therapies. This section also underlines factors influencing growth of the regenerative therapies market currently, along with detailed analysis of the key trends, drivers, restraints, opportunities and regulations. Impact analysis of the key regional growth drivers and restraints based on the weighted average model, coupled with key region-specific trends, is included in report to better equip clients with information and hidden insights. The global regenerative therapies market is segmented based on tissue type into allografts, xenografts, and alloplasts. Based on application type, the market has been segmented into soft tissue repair, cardiovascular, dental, orthopaedic, CNS disease treatment, and others. Based on end user, the market has been segmented into hospitals, ambulatory surgical centers, and educational institutes. A detailed analysis of every segment has been presented in terms of market size, Y-o-Y growth rate, absolute $ opportunity, market attractive index and BPS analysis. Among the various tissue types, allografts are expected to emerge as the product of choice both among surgeons and patients worldwide. Xenografts are also expected to gain popularity over the forecast period. The next section of the report highlights the growth trends in the regenerative therapies market, by region. It provides the market outlook for 2016–2022 and sets the forecast within the context of the regenerative therapies market. 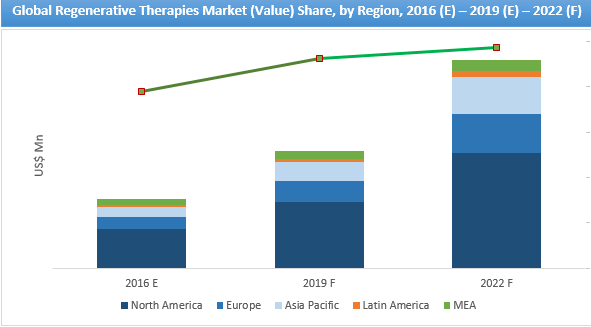 The study discusses the key regional trends contributing to growth of the regenerative therapies market worldwide, as well as analyses the extent to which drivers are influencing this market in each region. Key regions assessed in this report include North America, Latin America, Europe, Asia Pacific and the MEA. North America is expected to emerge as the most dominant and most attractive market over the forecast period. The above sections – by tissue type, by application, by end user, and by region – evaluate the present scenario and growth prospects of the regenerative therapies market for the period 2016 - 2022. We have considered 2014 as the base year and provided data for the forecast period. Detailed company profiles include company-specific long-term and short-term strategies, key offerings, and recent developments by the concerned companies in the regenerative therapies market. .
Regenerative therapies entail the application of specific types of cells or cell products for diseased tissues or organs, which would ultimately help restore tissue and organ function. It also involves the possibility of growing tissues and organs in the laboratory and safely implanting them when the body cannot heal itself. The global regenerative therapies market has been estimated to be valued at US$ 5,286.2 Mn by the end of 2015, and is projected to witness stable growth across all global regions, which is attributed to the rising demand for fulfilling unmet clinical needs for longer sustainability and faster outcome treatments within a shorter time span. The prime growth driver for the global regenerative therapies market is deficiency in therapeutic requirements. Currently, government support for treatment of various diseases is increasing globally, through the formation and adoption of supportive legislative and policy initiatives, which also include sizeable investments in regenerative therapies for creating centers of excellence, research networks, manufacturing infrastructure, and commercialization centers, among others. Furthermore, increasing demand for tissue-cell and stem cell research technologies as well as the products developed from them, which are used for treating various chronic diseases having no permanent cure, are the other important factors driving growth of the global regenerative therapies market currently. However, an ongoing trend that has been witnessed in the market is the increasing shift of companies from manufacturing of synthetic drugs to evaluating opportunities for generating medicines from an individual’s own tissues and stem cells. Being at an early stage of commercialization, the regenerative therapies market exhibits lucrative investment opportunities created by government, regional governing bodies, and private companies. Regenerative therapies find application in the treatment of various diseases, such as wound repair, orthopedic diseases, neurological diseases, cardiovascular diseases, autoimmune disorders, ocular diseases, and other rare diseases. The major reason why these therapies are used in the various treatments is because they facilitate long-term effectiveness and safer results among various diseased patients. Increasing regulatory harmonization to accelerate pace of product approvals is rapidly becoming a necessity for regenerative therapy players all over the world. Globally, Asia Pacific market is expected to expand at the strongest CAGR in the global market for regenerative therapies throughout the forecast period in terms of revenue. Growing regulatory harmonization and the fact that the local manufacturers are able to meet international standards maintained by the leading companies are among the major factors anticipated to lead to standardization of the regenerative therapies market in the region. Allografts tissue type segment is currently dominating the market in the region in terms of the tissue’s biocompatibility with patients. In addition, increasing contract research outsourcing in the field of regenerative therapies in countries such as Singapore, Thailand, and South Korea, which is primarily attributed to the availability of highly-skilled local talent pool and presence of highly-sophisticated research facilities and storage infrastructure (e.g. stem cell banks) in these countries, is expected to boost the market growth in the APAC region. Japanese government has been promoting liberalization of rules on regulations, which could expedite the route to market timeline for regenerative therapies. Most major governments in the countries in Asia Pacific have been promising positive support for regenerative therapies, a fact which could help in organ regeneration, tissue re-engineering, etc. Celebrity support is another crucial factor promoting growth of the regenerative therapies market in these countries. However, cost issues, lengthy clinical trials, and lack of standard guidelines options are factors expected to slightly hamper growth of the market. Europe is the second-most profitable destination for regenerative therapies currently. Collaborative efforts help minimizing probabilistic abandonment of clinical trials and raise involvement of SMEs in drug development, which is expected to become a norm in the region over the next few years. Unique medicinal fields, such as nephrology and Chronic Obstructive Pulmonary Diseases (COPD), are repeatedly being studied by researchers from Europe for carrying out breakthrough evidence-based treatments in the region. Thus, the market in the region is expected to expand at a stable CAGR over the forecast period in terms of revenue. Major companies based in Europe are seeking expanding their presence outside the region in order to be able to efficiently meet growing global demand for its products. North America is a prime regional market currently, accounting for over 50% of the overall regenerative therapies market in terms of revenue, and the trend is expected to continue over the forecast period as well. However, researchers are working on the development of new clinical infrastructure in the field of regenerative stem cell therapies, which is still in the initial stages of development, with a failure rate of 80% in the initiation phases. Moreover, there is an increasing penetration of tissue banks in North America. In these tissue banks, articular cartilage has been observed as a particularly good target for allograft transplantation. In addition, Canadian legislation for regenerative therapies is more supportive than in the U.S. Presently, the Biologics and Genetic Therapy Directorate (BGTD) of the Health Products and Food Branch of Health Canada is reviewing the guidelines written in 2000 for safety of cells, tissue, and organs for transplantation. Legislative support and regulatory harmonization are the two major factors expected to help simplify the clinical trial infrastructure in the region. Globally, the Asia Pacific market is expected to expand at the highest CAGR in terms of value, followed by Europe and North America. The Middle East & Africa market accounts for a nominal value share of the overall regenerative therapies market currently, owing to the absence of adequate regulations and inability of the various governments in the region to enforce regulations, which in turn has been promoting growth of untested and illegitimate regenerative therapeutic practices in South Africa in the field of stem-cell applications. Besides, cultural superstitions and failure to understand the working mechanism are factors that could delay entry of mainstream regenerative therapies in the country in the long run. Key market participants covered in the report include Acelity L.P. Inc., Mesoblast Ltd., Nuo Therapeutics, Inc. (Cytomedix), Astellas Pharma US, Inc., Organovo Holdings Inc., Orgenesis Inc., Sanofi, Athersys, Inc., Shire Pharmaceuticals Limited, and Cytori Therapeutics Inc,.